Water vapor and clouds are the major contributors to Earth's greenhouse effect, but a new atmosphere-ocean climate modeling study shows that the planet's temperature ultimately depends on the atmospheric level of carbon dioxide. 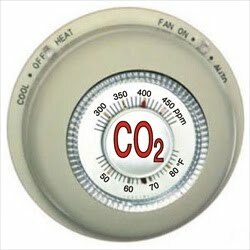 Without non-condensing greenhouse gases, water vapor and clouds would be unable to provide the feedback mechanisms that amplify the greenhouse effect. The study's results were published Friday, Oct. 15 in Science.